J Productions Media Ltd is a video production company based in Frimley, Surrey, and was established in 2008. The company chiefly works with SMEs, offering a one-stop service and creating video content for a wide range of marketing, training, and other corporate purposes. The company is owned by John Peddie who has been working with Ash Taylor since 2016, mainly as a mastermind member. John had not worked with a coach before and was recommended to Ash by not one but two business friend. ‘It was the fact that they independently suggested Ash that led me to him,’ he said. John had been running out of money — fast. ‘I knew how to do video, but I had no idea how to run a business,’ he said. ‘I had stumbled into a few contracts which had been keeping me afloat, but then I began losing them for various reasons. In one case the marketing person left and in another budgets were cut. At the point when he and Ash first met, John had approximately £1,000 in his business account. 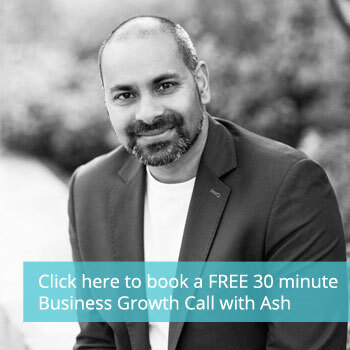 John had a few 1-2-1 sessions with Ash which kick-started the change process before be became a mastermind member. ‘I felt instantly comfortable with him,’ said John. ‘Ash came up with a top-to-bottom reboot of the business. He started by finding out what I wanted to achieve, then got me to define who my customer is, and then moved on to the website. John signed up to a call answering service, began using Google Ads, and got himself out from behind his desk and into networking events. Ash also helped him identify issues with his website and since resolving those he’s seen traffic improve and visitors stay longer. ‘My client base has grown enormously, as well as my confidence and focus as a business owner. I now have a clear understanding of where I want to be and what I need to do to get there. In 2016, John had just three clients, so when they pulled the plug he was in immediate trouble. Now he has more than 30 and the number is growing all the time. ‘You’re learning all the time,’ said John. ‘They’re an extra pair of eyes, and they’re not afraid to tell you that they don’t understand what you’re trying to say or do. ‘You learn from other people’s experiences, through sharing ideas, and having other owners look at your business from the outside. This gives you a whole new perspective. ‘He is never intimidating, and he really does walk the walk. He says what he needs to say, even if you don’t always want to hear it.